Home | All Aboard for a Day Out With Thomas! Is your child a Thomas the Tank Engine fanatic? If so, your chance to experience all things Thomas & Friends and even take a ride on a train drawn by Thomas the Tank Engine himself is coming this summer! Tickets are on sale now for Day Out With Thomas: The Big Adventures Tour 2018, which takes place over two long weekends, July 27–29 and August 1–5, at Roaring Camp Railroads in the Santa Cruz Mountains town of Felton. You can take a train ride, meet Sir Topham Hatt, enjoy some storytelling and videos, get creative with arts and crafts at the Imagination Station, and even get a (temporary) Island of Sodor friends tattoo. There's something for everyone. Of course there are also plenty of ways available to separate you from your cash, with just about every conceivable Thomas & Friends product available for sale. We attended Day Out with Thomas a few years ago and had a grand time. It's busy (bordering on chaotic, but in a good way), fun, and there's definitely no lack of things to do. When we took our ride with Thomas we got seats in the coach just behind him—try to do this if you can, because you can't see him very well from anything more than two cars back or so. Tickets to Day Out With Thomas at Roaring Camp Railroads are $21 each if purchased in advance and $25 for peak times (Saturdays and Sundays from 10:30 am–2:30 pm). Tickets cost $25 at the gate. Tickets are required for everyone aged 2 and up. Tickets include all entertainment and activities as well as a 25-minute train ride. This event is always very popular, so if you're planning on attending this year you should purchase your tickets in advance, which you can order online via TicketWeb or by phone at (866) 777-8931. Tickets are timed and dated and specific to the car you'll be riding in (there are both open and enclosed cars), so order early for best availability. Parking at Roaring Camp for Day Out With Thomas is an additional $8 per vehicle. Food and beverages are available for purchase at the event. Roaring Camp Railroads can be found in Felton 5401 Graham Hill Road. To get there from Marin, take Highway 101 south to Highway 17 west in San Jose. Take Highway 17 over the Santa Cruz Mountains to Scotts Valley, and take the Mt. Hermon Road exit and follow Mt. Hermon Road 3-1/2 miles to Felton. Turn left on Graham Hill Road; Roaring Camp is 1/2 mile up on your right. 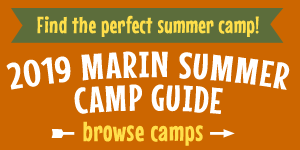 Visit Roaring Camp Railroads online at www.roaringcamp.com for local lodging suggestions and more information. If you're going to make a road trip out of the event, you could plan on spending a long weekend down there and hit the Santa Cruz Beach Boardwalk, too, or drive a little further south and visit the Monterey Bay Aquarium and Pacific Grove.